The Prostate Support formula is a unique combination of six premier herbs that each works in a different way for maximum prostate support. With Saw Palmetto, Pygeum Africanum, Plant Sterols including Beta Sitosterol as well as Turmeric and other inflammation reducing herbs, you get the best prostate support available. All of the ingredients in the Prostate Support formula work synergistically to help you maintain prostate health. Benign Prostatic Hyperplasia, or BPH, is a non-cancerous enlargement of the prostate and generally begins in the 30's, however the symptoms don't always become apparent until later. But by the age of 50-60, most men will begin to experience the symptoms of BPH to some degree, including difficult urination. Both Saw Palmetto and Pygeum Africanum have been shown to be very important herbs for maximum prostate health. Studies show that Saw Palmetto may be an effective aid to prostate health without the common side effects of prescription medication. Whole herbs are used and not isolated fractions for maximize benefit. Plant sterols found in both Saw Palmetto and Pygeum Africanum are important for optimal prostate health. So we added the main plant sterol, Beta Sitosterol to the Prostate Support Formula to enhance the beta sitosterol found naturally in both these herbs. But there are other plant sterols that are also important. So we added Campesterol, Stigmasterol and Bassicasterol for maximum effectiveness. Some people believe only the fatty acids and plant sterols that are found in Saw Palmetto and Pygeum Africanum are the only 'active' ingredients. But it's not true! Plants are chemically very diverse and are composed of many elements. Researchers regularly identify plant chemicals that were previously seen as unimportant as in fact being very important to the overall effect of the plant. we've currently identified them as such or not! And because of this broad diversity found in every herb, we prefer the whole roots or leaves just as nature intended for maximum benefit rather than individual elements because they are all active in some way. 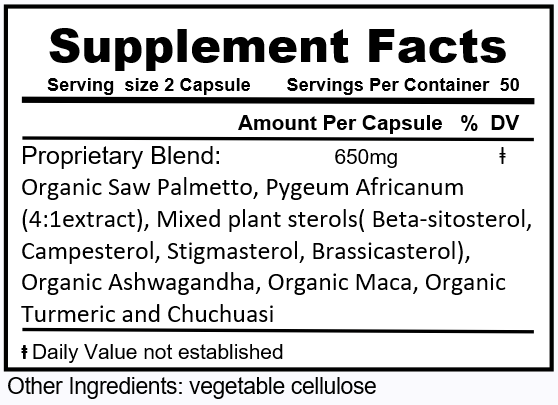 Don't wait for science to identify other active elements when you can get ALL the components of both Saw Palmetto and Pygeum Africanum right now in the Prostate Support Formula! We also added the herbs Turmeric, Ashwagandha and Chuchuasi to effectively reduce inflammation, a major cause of difficult urination. Ashwagandha is an amazing tonic herb with many important functions. But one of the most important is its ability to reduce inflammation. As a natural COX2 inhibitor, it can help dramatically reduce pain and inflammation and is also an important ingredient in our Pain and Inflammation Support formula. A little known herb which we have included is Chuchuasi from the Amazon rainforest, a treasure trove of natural remedies. As well as its ability to reduce inflammation, it is also a mild muscle relaxant, which may help further reduce difficulty with urination and emptying of the bladder. Chuchuasi is one of the most important herbs coming out of the Amazon rainforests and is also found in our Pain and Inflammation Support formula. Both Maca and Ashwagandha help tone and balance the prostate gland. Studies have shown that Maca as well as Ashwagandha can affect hormonal balance in both men and women, which is a known factor in prostate enlargement. Due to their role in hormonal balance, they are commonly found in sexual enhancement products. Maca also has a high nutritional content including selenium, an important nutrient for prostate health. Natural remedies are the best way to support health because they are so broad in their application and benefits and yet have virtually no negative side effects, but many side benefits. Once you understand how herbs work, it is easy to include them in any health building program. Suggested Usage: As a dietary supplement, take 2 capsules 2 times daily between meals in the morning and evening.